5 Easy Make-Ahead Breakfasts the Whole Family Will Love #infographic ~ Visualistan '+g+"
No time for breakfast in the morning? We hear you. While breakfast may seem like the last thing on your mind when you’re hustling out the door before work (and maybe getting kids ready for school) make-ahead meals can save you precious weekday morning time. And let’s face it—a cup of coffee or two doesn’t exactly constitute as a healthy breakfast that’ll keep you energized and productive until lunch. Whether or not breakfast is the most important meal of the day—the jury’s still out on that—there are some notable, science-backed benefits of eating a healthy meal in the morning. For instance, breakfast eaters tend to have higher daily fiber and calcium intake, a higher likelihood of meeting fruit and vegetable intake recommendations, and better work and school performance. 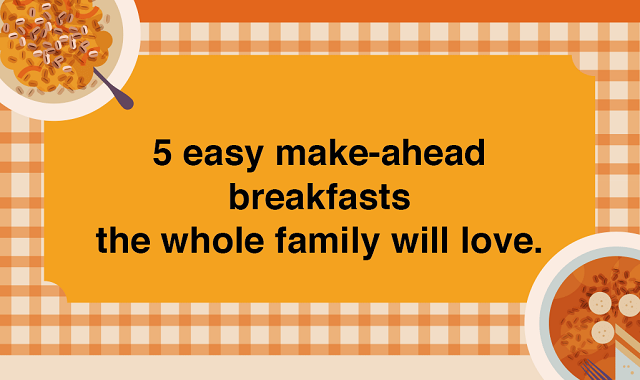 Check out the infographic below for more reasons to make time for breakfast, plus eight delicious sweet and savory make-ahead breakfast recipes.